I create a high-end, exclusive collection for women. Items are extremely limited or one-of-a-kind items with couture trims and details. Designer fabrics are incorporated into most pieces. There is also the option to have a piece created especially for the customer. Everything is designed and created by me, personally. My specialty is designer fabric jackets for day or evening with wonderful trims, edgings and closures. 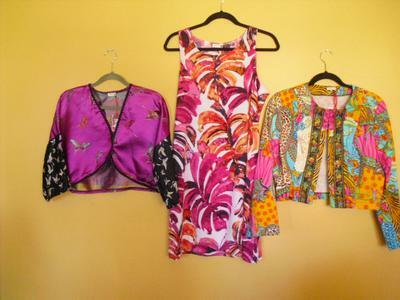 I also have draped jackets and tops. I cater to all women, but especially towards women over forty who continue to enjoy looking young and chic! I limit my designs to no more than five from the same fabric, typically one per size; and usually change up the trims from size to size-my clients get a couture/custom garment at a reasonable price.